Hello, everyone! 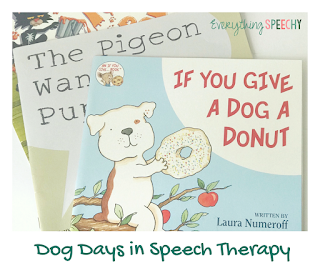 I am so sorry I have fallen behind on my therapy themes series, but you know how busy a school-based SLP can get. I have had a ton of evaluations, and no time to blog ☹, but I thought I would quickly pop in to tell you about one of my favorite things to do for middle and high school speech therapy: Christmas ornaments! The good thing about this age group is that their attention, fine motor skills and hand-eye coordination are generally better than my elementary kids. Therefore, they can complete some more complex ornaments independently. Yay! The bad thing is that it might be a little harder to find ornaments they are willing to make because, you know, preteens and teenagers. I found three on Pinterest that have been successful in my therapy room. They are relatively inexpensive and are easily incorporated into sessions. The first one is from a previous blog post. I used it with my life skills group, but I think it’s appropriate for all ages and abilities. Materials needed are cardstock, yarn, and glue. Some students may complete it fairly quickly, which makes it ideal for 15-minute sessions as well. Find it (and a freebie) here. I adapted the second one from This Grandma is Fun. It is a little more difficult to make, so it might be a better choice for students who have typical fine motor abilities. For some of my groups, I showed them the finished product and let them make the ornament independently while waiting for turn. I also allowed them to continue working on the ornament while completing their targets. Materials needed are cinnamon sticks, ribbon, some kind of star for the top, a paperclip, and hot glue. Find it here. The third ornament was inspired by this post on Organized 31. To save a little bit of money, I used the smaller (1 inch) ball ornaments that come with more in one package. In addition to those, materials needed are only permanent markers, alphabet stickers, and paper clips or hooks. 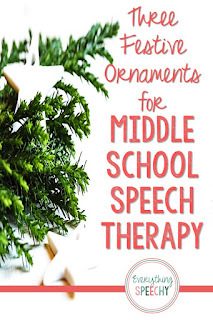 These ornaments look fantastic after the kids finish them! I hope you find these useful for your older students. If you have other fun ideas for this population, please share below. Have a lovely Christmas, and a wonderful New Year! I have provided Amazon Affiliate links for your convenience. If you choose to purchase something after using the link, I may earn a small percentage of the purchase price from the seller. Hey, guys! 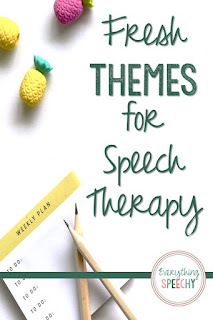 In my last post, I talked about using different themes to plan for speech therapy. For the first couple of weeks of therapy this year, we went with cupcakes. 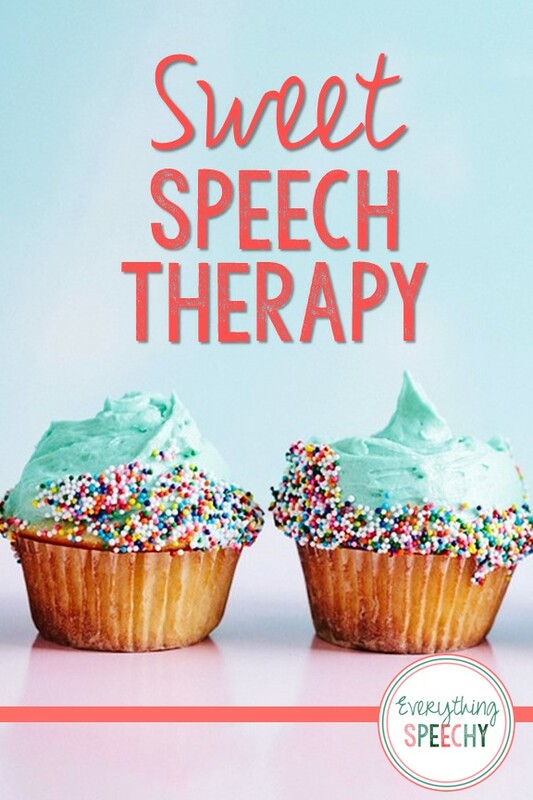 I like to call the theme “sweet speech” because it has a nice ring to it, but the focus was really on cupcakes rather than ice cream, cookies, candy, etc. We had lots of fun using the following ideas. We used silicone cupcake cups, candles, and sequins with play dough to “make” cupcakes. This worked well for sequencing, describing, and also targeted some fine motor skills. This activity provided reinforcement for all skills as well. For example, following a speech turn, a child would receive the play dough. She could try rolling the dough into a ball and then shaping it into a cupcake while the next child had his speech turn. It could also be turned into a game by using the candles. I used the Make Dice app on my iPad to determine how many candles a child would get after her turn. Whoever had the most candles won the game. You can also find an articulation freebie to go with play dough cupcakes from Sounds Like Fun on Teachers Pay Teachers here. Full disclosure-I did not use this particular activity this time, but I wanted to give you all (especially middle and high school peeps) another option. It is, of course, actually baking cupcakes. Using recipes and cooking activities in speech therapy, particularly in push in services, is a great way to reinforce language and life skills. Almost any language goal and many articulation goals can be targeted during cooking lessons. Sequencing, following directions, requesting, commenting, vocabulary, and positional concepts are just a few! Mia McDaniel has a fun Cupcake Quick Drill game on Teachers Pay Teachers that is great for any skill and any age. Find it here. used die cuts and paper punches to cut out the shapes for this one from scrapbook paper. These quick progress notes work well for all cupcake craftivities. You can download them free by clicking here. 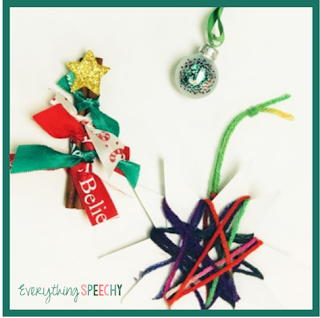 Some other ideas can be found on my SpeechSnacks Pinterest board. Sounds Like Fun included a couple of games as well as other activities in Speech and Language Pack: Cupcake. Because of time constraints, I was not able to actually bake cupcakes with any of my groups. However, we did get a chance to practice cupcake decorating! We used those mini party cake muffins that come four to a pack in a box of five packs. Each student received one muffin. 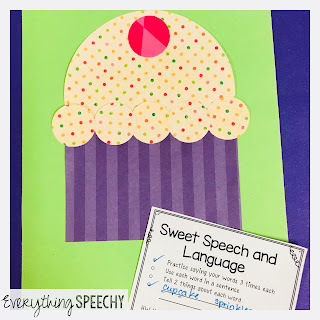 We took turns targeting speech goals, then requesting things to add to our “cupcake”: icing, sprinkles, etc. This activity was definitely the favorite since everyone got to eat the cupcake after! If you have any other tips or fun ideas that go well with a cupcake theme, please comment below. Have a great week! Hey, guys! It’s back-to-school time for me which means it’s also time to plan for therapy. Like many school-based SLPs, I have typically used themes to plan for my groups. Themes are great because they make it easy to find activities for a variety of goals using one idea. For early elementary school, themes such as autumn, back-to-school, and apples are being used in the classroom as well which helps carryover. Many older students have background knowledge of those same themes which allows me to target skills based on what they already know. On the other hand…using the same themes year after year (16 years in my case) can get REALLY boring. After using an apple theme one September for what seemed like the millionth time, I was more than ready for a change, and so were some of the students I kept more than a year. However, I still wanted to facilitate carryover, scaffold easily, and make therapy plans simple. Lucky for me, I share an office with my favorite SLPs and we are able to bounce ideas off each other frequently. Like me, they were also tired of the same old themes, but wanted to keep the good things about theme planning. 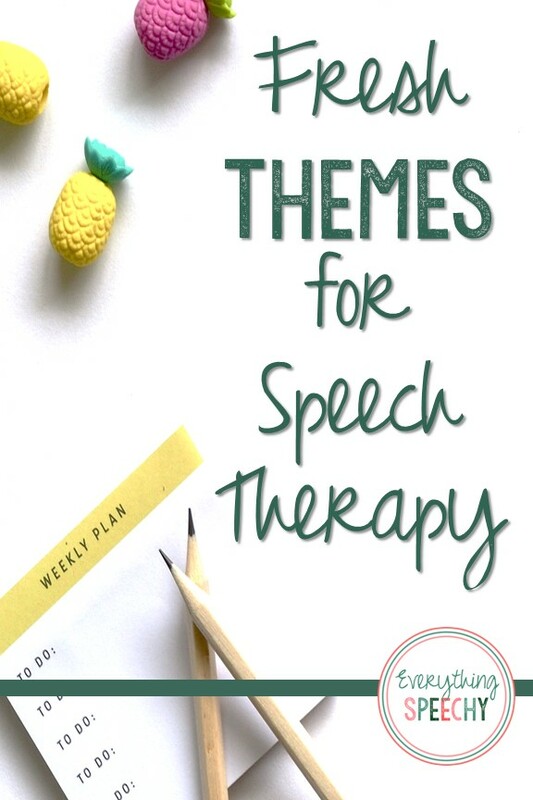 After talking about it and searching Pinterest, we developed some new theme ideas which also allow for those three important characteristics of therapy planning: carryover, scaffolding, simple! Of course, we still pull out the some of the other themes occasionally, but having a few new ones helps keep things fresh. In July, I published a blog post about using a “Dog Days” theme in speech therapy. It's a great theme for August, and you can find it here. If, you are ready for some new therapy themes, I plan to write about several of them in upcoming posts. Be sure to sign up for my newsletter to be notified when they are published! Have a great August! Hello, everyone! I hope you are all surviving the heat of this summer! Growing up, I often heard the hottest part of summer referred to as “dog days.” Apparently, the original dog days were used in Greek and Roman astrology to refer to the time period for the rising of the star Sirius (the dog star). Recent research (on Wikipedia) revealed that the time frame for the dog days of summer varies, but if you use the term for July-August in the United States, you are probably using it correctly. You are especially using it correctly if you are referring to the miserable, hot, humid, sweltering weather here in the Southern US (according to me, anyway). 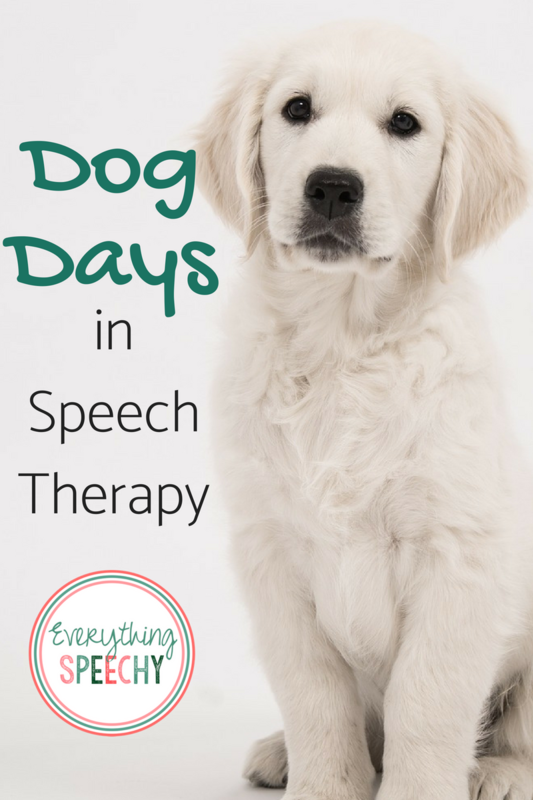 To help you survive these dog days, I want to share with you some ideas for using a dog theme in speech therapy. Most people like dogs, and this is a theme that works well for all ages (preschool-high school and beyond). My second recommendation comes from a colleague whose students CONSTANTLY request this game: Doggie Doo! I get a little grossed out, so I haven't played it, but her kids think it is hilarious. For the littlest littles, I like to use toys such as a vet kit or pet grooming kit with stuffed dogs in play therapy. 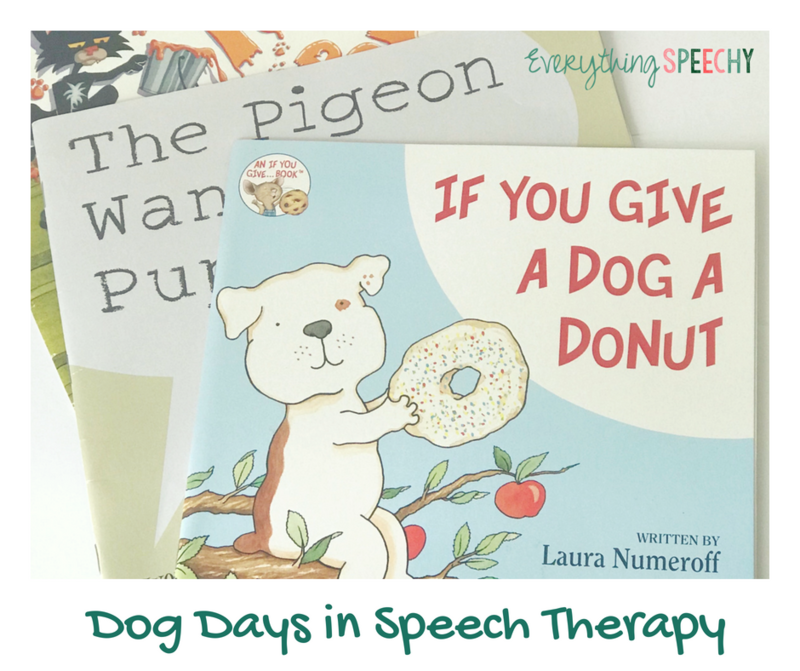 For larger groups of elementary-aged kids, “Doggy, Doggy, Where is your Bone” is a good game to use to target speech and language goals while having fun. For middle school, I frequently use the site Newsela.com. Several great news stories starring or about awesome dogs can be found there. Another idea that would be interesting for older kids, teenagers, or adults would be to research dog breeds for compare and contrast, describing, etc. The American Kennel Club has this information on its website. As always, dozens (maybe even hundreds) of craftivities can be found on Pinterest. Some of my favorites can be found here. Lastly, there are tons of resources on Teachers Pay Teachers as well. 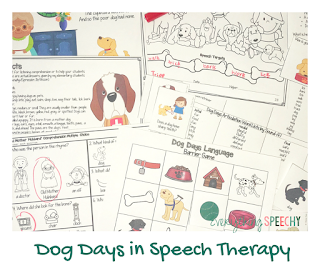 For an easy packet that targets multiple speech and language goals, take a look at my Dog Days Pack. It works well for PK-2nd grade. I hope you have found something useful and fun for your kids/students/clients during the last half of summer! 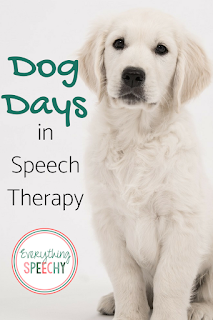 If you have any other doggy ideas for speech therapy, comment below. Have a fantastic week! Well, guys, it’s that time of year again. I have been back at work since July 31. If you are like me, you are so busy at the beginning of the school year and you need some easy, no-stress tips to get you back in the groove. 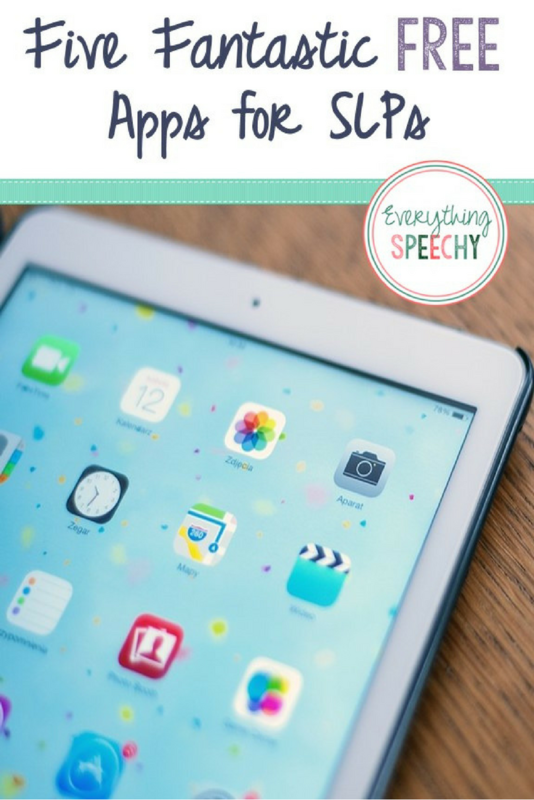 This month, I’m sharing my five favorite FREE apps for speech therapy. Take a look and let me know what you think! © Everything Speechy. Blog Design by RachBV Designs. Template by Georgia Lou Studios. All rights reserved.